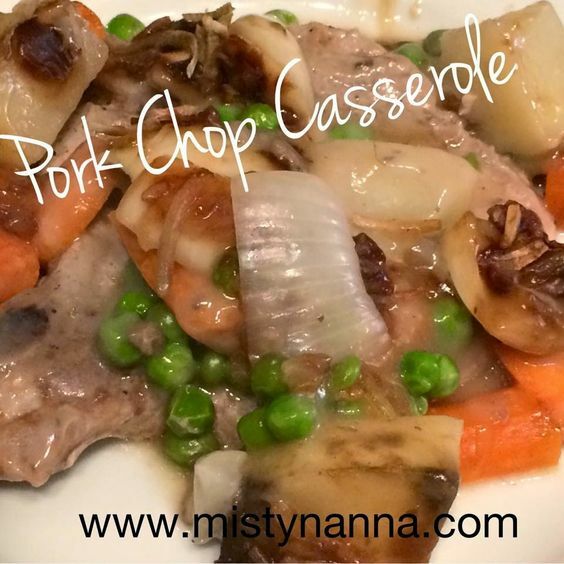 This pork chop casserole recipe is to die for!!!! I guarantee it will be the BEST homemade pork chop dish you will ever have!! This recipe is so full of FLAVOR!! My father in law comes from a family of chefs and this is one of his favorite dishes of mine. This meal is so EASY to prepare and cooks in the oven while you can get some other things done around the house. This recipe is a WINNER!!!! Please comment and let me know how you like it!! *My kids love these veggies, so I just keep adding more until the pan is full! 1. Cut the veggies as posted above. 2. Sprinkle a little sea salt and pepper on one side of the pork chops. 3. In frying pan, brown the pork chops on each side. 4. Spray a 13x9 pan. Place the potatoes on the bottom of the pan. Then add browned pork chops on top of potatoes. 5. Add your carrots, peas and onion. 6. Pour and spread the cream of mushroom soup on top. 7. Sprinkle the dry onion soup on top. 8. Cover with tin foil. 9. Bake in the oven @ 425 degrees for 1 hour. - Make sure vegetables are soft before serving. Lose That Skirt!! Show Off That New Bathing Suit! EEKKK.....It taking a lot of guts for me to post this picture, but Im ready to SHOUT it out...."MOMS, I'm DONE with the SKIRT!!!" LADIES.....If you read my post a few weeks back about me wearing the ugly Chciago Bears skirt to the pool, then you know what I'm talking about! This is me, with my son in Florida, yesterday at the beach. I have not worn a 2 piece suit in 6 years!! I will admit, it was a little weird putting it on for the first time this week, but once I got out on that BEACH, I felt PROUD!!! My body is not perfect. I've come to terms that my stomach will never be the same after having 3 c-sections in five years. Yes, I have SCARS on my stomach, I have HANGING skin when I bend over, BUT that doesn't matter. I'm proud of my WARRIOR marks on my body. Women, you know what I mean!! I may have my battle scars, but that was not an EXCUSE not to be healthy and lose weight. After a year with Beachbody workouts, I am down to my pre-pregnancy weight. I FEEL amazing!! I have my ENERGY back. I SMILE more often. I'm just a HAPPIER person both inside and out! MOMS....show off your warrior wounds this summer! No more hiding under that ugly skirt!! Let's get you out of that SKIRT and into something that makes you feel PROUD!! Now is the time to get started on your fitness journey. Do this for you!! ~ Are you ready to make that change? ~ Want to feel like YOU again? ~ Time to get rid of that ugly skirt? I would love to help you. 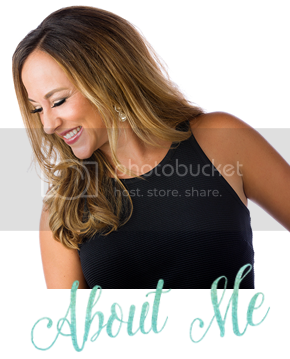 My next accountability group starts APRIL 12th. Feel free to comment or message me for details. Holy AMAZING!!!! 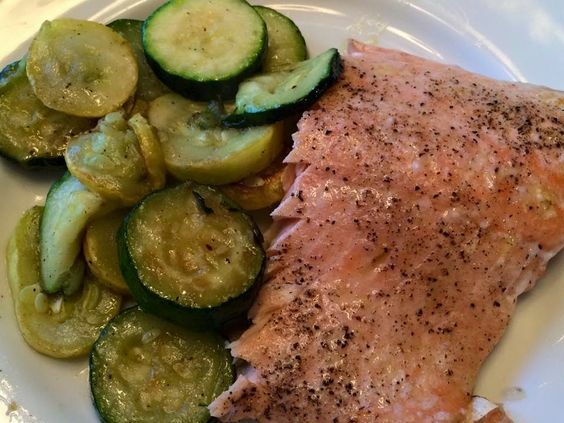 The salmon with zucchini and squash is out of this world TASTY!!!! So simple, quick and delicious!! As soon as I put that fork in my mouth, my taste buds melted!! - Cover pan with foil. - Place salmon on pan, skin facing down. - Rub olive oil on top of the salmon. - Sprinkle sea salt, pepper and lemon juice on top. - Place in the oven at 425 degrees and cook 13-15 minutes. -When done, you should be able to easily flake the salmon apart with a fork. The middle should also be opaque. - Slice zucchini and squash very thin. - Add zucchini and squash. -Toss until tender and crisp. - Add sea salt and pepper. 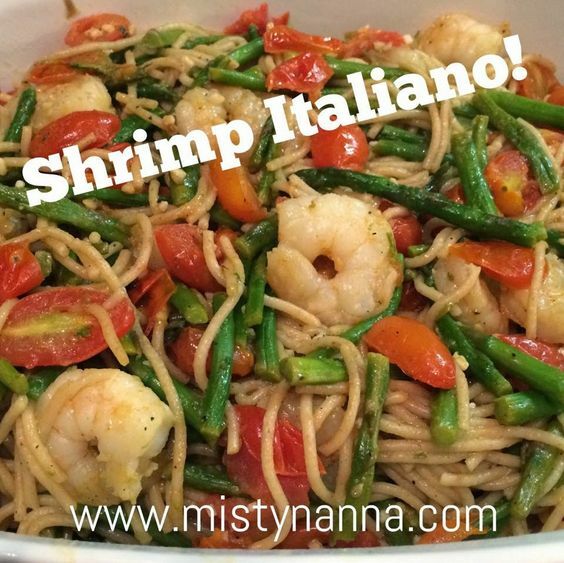 Shrimp With Whole Wheat Pasta! OMG....this recipe will make your house smell AMAZING!!! Oh how I love garlic!! My dad would be proud! The flavor is unbelievable!! My daughter, Giada, said she just can't stop eating it. It tastes like it came straight from an Italian restaurant! Mangia, mangia!!! - Heat a cooking pan with olive oil and add a tbsp of garlic. - Place asparagus and tomatoes in the pan. Salt and pepper for taste. Toss and and let cook for 5 minutes or until tender. - Place pasta in the pan with shrimp, asparagus, and tomatoes. Toss and mix with the juices for flavor. "Beach Fit" group starting March 16th!! Ok Ladies...take a look at these 2 pictures. Both bathing suit #1 and #2 are both one pieces. How many of you see women at the pool or beach in a suit like #1? A LOT, right? Now the question is WHY? I know the ANSWER...you want to cover as much as possible because you are insecure about your body. Did I GUESS right?? With working out only 30 minutes a day and cooking clean meals, I now have a completely different looking body that I will no longer HIDE behind the ugly "skirt". You can too!! It doesn't always have to be a bikini, you can ROCK OUT a super cute one piece like suit #2 and feel CONFIDENT!! Throw away that skirt!! Summer is only 12 weeks away. Who is ready to start getting in SHAPE NOW so you are ready to hit the pool Memorial Day Weekend? - Me as your Free Coach! Comment or message me for more info! Turned out great!!!! Clean eating Beef Stroganoff in the crockpot. So juicy....melts in your mouth!! Easy and delicious!! A definite favorite!! - Mix flour, salt and paprika in a gallon size ziploc bag. Place in chunks of beef and seal. Toss bag around to coat evenly. - Fry beef in a frying pan in olive oil until all sides are lightly browned. - Layer onion, mushrooms, rosemary, garlic clove, and fried beef in the crockpot. - Pour broth over the top of content of the crockpot. - Cook on high for 4-5 hours or low for 8 hours. - The last 10 minutes, stir in yogurt cheese. Serve over the top of prepared noodles or rice. My husband Todd......LOST 28 pounds and over 30 inches!!! He went down 3 PANT SIZES!!! I am SO PROUD of him and I have to announce it to the world!!!! HOW did he do this? He lost his last 18 POUNDS with the 21 DAY FIX!! After the holidays, he put back a few pounds and was mad at himself for gaining after all of his hard work with P90x3 and PiYo. I convinced him to try the 21 DAY FIX with me after New Years. After just 2 1/2 rounds, Todd is at his COLLEGE WEIGHT!! He is so EXCITED, he can't stop smiling LOOK AT THE PICTURES....CRAZY, RIGHT??? Once you see RESULTS, you can't stop!! Its the BEST FEELING! Todd had to leave for work at 4:30 a.m. this morning. Would you believe he woke up at 3:00 am to get in his 21 Day Fix Yoga before he left. You know why? He LOVES the RESULTS he's seeing!! It makes him a better husband, father, lacrosse coach and most of all....he's happiest with HIMSELF! !